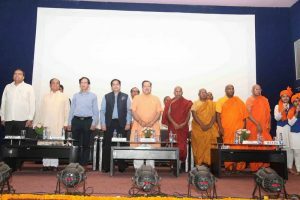 The profound and meaningful teachings of Gautam Buddha along with the need for peace and harmony formed the crux of a religious and cultural meet based on ‘Tathagat Buddha Chivar Daan Pooja Karyakram’ along with the ‘Third Tathagat Buddha Darshan Yatra Bodhgaya’. 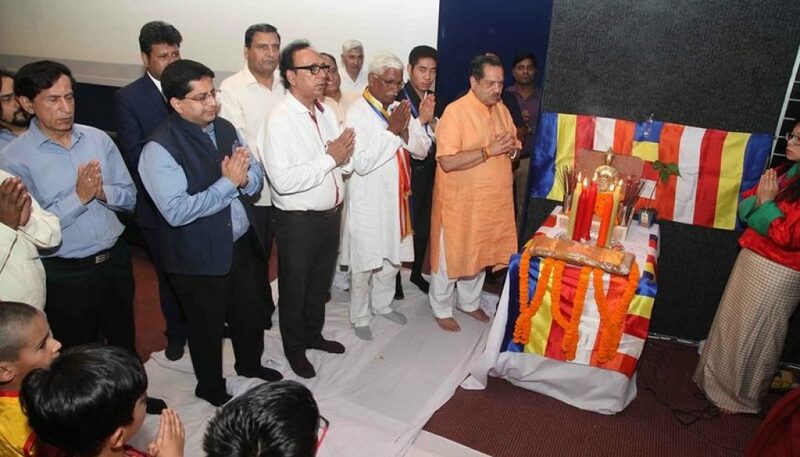 This deeply spiritual event held at the MRIU campus here today, was organized by Dharm Sanskriti Sangam and Manav Rachna International University under the able guidance of Shri Indresh Kumar Ji, Patron, Akhil Bharatiya Dharm Sanskriti Sangam. 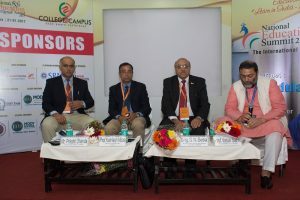 The programme was also graced by Dr. Prashant Bhalla, President, MREI; Shri Sumitanandji, Joint Secretary, Akhil Bharatiya Mahabodhi Sangh; Dr M.M. 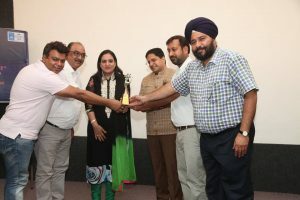 Kathuria, Trustee, MREI; Dr N.C. Wadhwa, VC, MRIU; Dr. Sanjay Srivastava, MD, MREI; Dr Sarvanand Arya, National President, Dharm Sanskriti Sangam; among others. The programme was also attended by religious scholars, academicians and Bhutanese students and delegates who are at Manav Rachna as part of their training on Health and Fitness. The religious programme which began on an auspicious note with the lighting of the lamp of wisdom in addition to the Vande Mataram song and Saraswati Vandana by MRIS Charmwood students, also witnessed a welcome song being presented by students of Dr.B R Ambedkar welfare Society. The entrance to the auditorium came alive with the dramatic depiction of Gautam Buddha’s life and teachings as students from MRIS Charmwood enacted glimpses of his life and sayings. 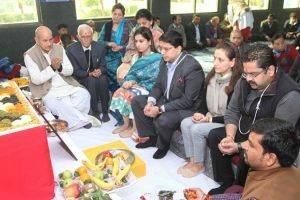 The occasion marked the chivar daan ceremony and puja which is part of an ancient Buddhist tradition in which the sacred cloth is offered and a puja performed before Gauram Buddha’s idol. Mantras were chanted and there was on stage an air of piety and holiness. The sacred cloth will be taken all the way to Bodh Gaya by a religious contingent and offered as an adornment at the very scared place where GautamBuddha is said to have attained enlightenment to spread the message of peace and ahimsa among all fellow human beings. Speaking on the occasion, Shri Indresh Kumar Ji, said, “Manav Rachna International University is based on the foundations of the legacy and vision of Dr O.P. Bhalla who dreamt of creating better human beings. The Institution is in essence carrying forward his legacy of spreading quality education and working towards instilling the right values among its students. In today’s world, true education lies in giving back to society. Good governance is all about being good to the less fortunate. Be respectful towards the less privileged as a means to spiritual salvation and personal growth.” He also called for the need to take the Ahimsa pledge as laid down by Gautam Buddha thousands of years back. Manav Rachna Educational Institutions wins National Education Excellence Award 2017 for being the ‘Best University in Innovation & Research’ making its mark for its research-driven focus at the 2nd National Education Summit & Awards 2017! Press Release: Manav Rachna is organizing a week-long Maha Mrityunjaya Yagna to usher in the New Year!